This sky map shows the locations of the Canis Major (Big Dog), Canis Minor (Little Dog) and Orion constellations in the southeastern sky at 9 pm ET as seen from the U.S. East Coast. Accompanying the well-known constellation Orion, the mighty hunter, across the winter sky in the Northern Hemisphere are two of its most faithful starry companions: Canis Major (the Big Dog) and Canis Minor (the Little Dog). While the Orion constellation may be among the more recognizable star patterns, his doggie companions can be a dazzling sight for skywatchers with clear, dark skies. In fact, the brightest star in the sky – Sirius, the "Dog Star" – shines from Canis Major. You can see it blazing prominently low in the east southeast as darkness falls this week. 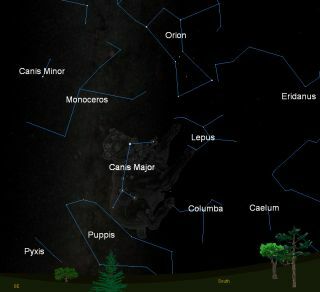 The sky map of Orion and the dog constellations in this skywatching guide shows how to spot them in the southeastern evening sky. Sirius is also the unquestionable ruler in its own section of the sky; a truly dazzling object. At a distance of 8.7 light-years, Sirius is the fifth-nearest star known. Among the stars that can be seen with the naked eye, it is the nearest of all, with the exception of Alpha Centauri. The star's color appears a brilliant white tinged with a distinctive bluish hue. An admirer of Sirius once compared its sparkle to that of a brilliant diamond. Sirius' name appears to be derived directly from the Greek word for "sparkling" or "scorching," and one can understand how it received these titles upon seeing it this week at around 6 p.m. local time on the eastern and western U.S. coasts, when it’s still rather low on the horizon. When the star is at such a low position in the sky, the thicker layer of air nearest the horizon causes its light to scintillate rapidly, causing it to seem to flicker with all the colors of the rainbow. Ironically, this is when Sirius seems to attract the most attention; people call their local planetariums inquiring about "… that strange and colorful UFO that was dancing above the east-southeast horizon." By 10:30 p.m. local time, Sirius is reaching its highest point in the sky, due south and shining with steadier blue-white glow. The rest of the stars of Canis Major, with some imagination, can be made out to somewhat resemble a dog. In his classic sky guide, “The Stars: A New Way to See Them” (HMH Books, 1976), the late astronomer H.A. Rey used Sirius for a dog tag. The brighter of these two stars is the "little Dog Star," known as Procyon, the eighth brightest star in the sky. It is a yellow-white star, six times as luminous as the sun. The name Procyon has been in use since the days of ancient Greece. It is the equivalent of the Latin word "Antecanis" or "Before the Dog," an allusion to the fact that Procyon rises about 20 minutes before Sirius (at midnorthern latitudes), and thus heralds the appearance of the great Dog Star. The next line on the tape was, "If you do see a dog here, perhaps you had better see a doctor too."